SOS Dinos in Distress is one of our featured apps in the At-A-Glance: Dinosaur Apps for Kids post and is a highly entertaining and imaginative storybook app for children that takes readers on a journey with Thaddeus Getsit-Wright as he tries to solve the dinosaur mystery. Full of great illustrations, narration, interactive features, and a very creative storyline, children are going to love all that this story has to offer. Creative, entertaining, and very well done! One thing that is not included in this app is text highlighting. Most of the storybook apps these days include text highlighting, however this app is so charming and well done that it doesn’t seem to matter too much. For some parents it might be nice to include it so young readers can follow along. There is no doubt that SOS Dinos in Distress is highly entertaining. The storyline and narrative voices alone make for a very fun and engaging experience. The additional interactive activities scattered throughout also help to keep children engaged. Things like resetting a Rubik’s cube, using a compass, sifting through the mail to find clues, and many more is a great way to keep children interested in the story. 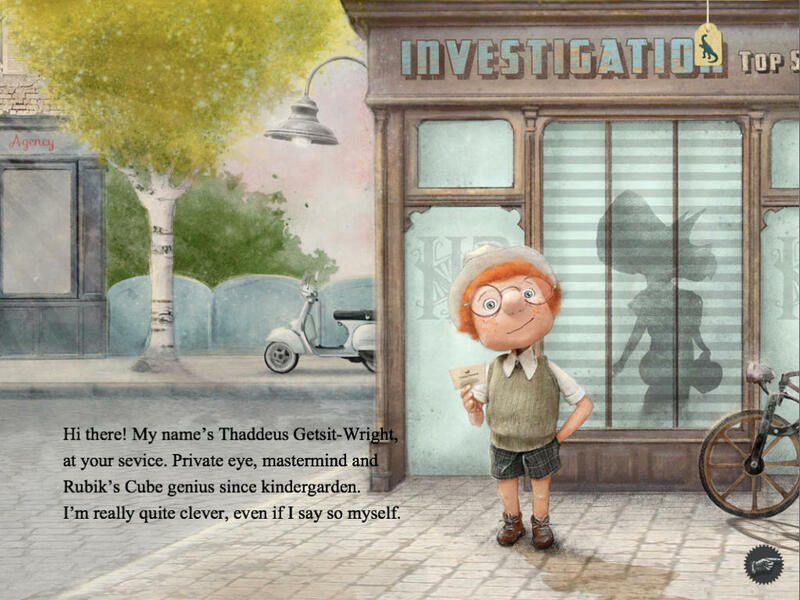 Readers can also manipulate the device by shaking it or turning it in order to uncover new clues to help Thaddeus solve his mystery. One thing is for sure whether children read this on their own or they follow along with the lively narrator, they will enjoy every second of this cute story. Priced at just under five dollars, this app is a bit more pricey than some other e-book apps, however it is very well done. The images are extremely high quality, the narration is top notch, and the interactive pieces throughout create an engaging experience for children. The only thing missing is text highlighting, which is expected especially at this price point. Children of all ages can enjoy this delightful tale by reading to themselves or by following along with the narrator. The developers have included arrows at the bottom of each page to help children progress through the story and the rest of the user interface is very intuitive. The interactive pieces are set up in a way that children simply know what to do (by simply tapping images) so a lot of instruction is not needed. In the areas that need a bit more guidance (like moving the device from side to side) the developers have included a small icon that guides readers on what to do. Parents can rest assured knowing this app is safe for children to use. There are no social media links, in app purchases, or advertisements included in this app so children will not be getting into areas they shouldn’t be. Parents can simply allow their little ones to read and explore this awesome story all on their own.